Looking for good value ski transfers? Sunny but snow-sure slopes? A wide range of slopes for all ski levels? Then you have found your dream destination for this winter! 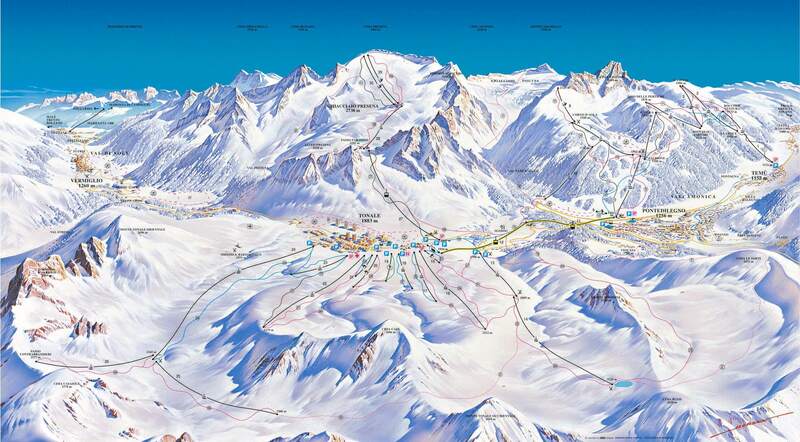 Passo del Tonale is one of top 10 Italian ski resorts! Passo del Tonale is one of the first tourist resorts in the Alps to open its ski lift facilities and one of the last to close them. Here you’ll find vital information on the Passo del Tonale ski resort as well as help and guidance in booking your transfer. Passo del Tonale located as high as 1883 m is one of the highest ski resorts in Italy. The resort is lying between two beautiful valleys - Val di Sole and Vallecamonica. The resort and its surroundings is open to the sun and gives you fantastic panorama views of the altitude from 1883 m to 3030 m. Passo del Tonale slopes are connected to other resort slopes such as Ponte di Legno and Temu, giving you a wide offer for great ski holidays. There are no direct train connections to the resort, but you can take the train to Trento and from there switch trains to Malè. From here any transfers can be arranged. If you are travelling from Brescia, take the train till Edolo and continue your journey by coach. Whatever your travel plans when heading out to Passo del Tonale, Alps2Alps uses a dynamic and flexible pricing system, in order to keep costs for our customers as low as possible. By taking into account the specifics of your trip, we can offer you the best possible deal for your group, whatever time of year you travel to Passo del Tonale. Whatever your needs, Alps2Alps promises to get you to Passo del Tonale comfortably and reliably for the lowest possible price. All of the above will only ever result in our base-rate for ski transfers going down – we never over-inflate our prices at any time or for any reason. We also offer substantial discounts for off-peak, off-season and midweek transfers to Passo del Tonale. If looking for the best possible deals, travelling outside peak season or midweek typically results in the biggest savings. We offer midweek (Monday to Friday) prices with up to 60% discount than weekend prices. Passo del Tonale sits at 1883 m with pistes from 1884 m to 3030 m above sea level. Passo del Tonale is a great destination for intermediate and beginner skiers as well as those with families. From first-timers to seasoned pros, there’s plenty on offer for everyone. In the Passo del Tonale, beginners can join one of the ski schools, where areas equipped with special carpets, help make first skiing experiences memorable for all the right reasons. Experienced skiers can catch adrenaline doing tricks and turns in the Presena snow park. You can book a private ski instructor, if the whole family is learning or improving their skills together. Your smaller family members can have their time in ski kindergarten. With professional teachers and entertainment staff your children can have a blast in large and sunny area with numerous games and winter activities. They can also upgrade their ski skills through different games with fun and without fear. Do yourself a favour and get your trip off to a flying start with a little help from Alps2Alps. We’re proud to offer the most reliable, affordable and enjoyable Passo del Tonale resort transfers, all throughout the season. Take a load off and start enjoying your holiday the moment you step on board. If you’re out to get the best possible deal on your resort transfers to and from Passo del Tonale, be sure to book in advance. Or if you can’t find the service or destination you’re looking for on our website, get in touch with the Alps2Alps customer service team today.